'We would never leave them in the field, ever. You're not going to leave them on the street." In a Tim Horton's parking lot, a brisk wind gusts towards Dartmouth's Highway of Heroes three kilometres to the south as Dave Peavey arrives. At his side is Norm, the certified service dog he got in May 2014 to help him cope with post-traumatic stress disorder from 18 years of service in Canada's army and navy, including tours of duty in Somalia, Bosnia, Haiti and Afghanistan. But while Norm may have saved Peavey’s life, the service companion was also the reason he lost the first lodgings he felt safe in since being medically discharged from the Forces in 2005. Shortly after Norm arrived, Peavey’s landlord issued him an eviction notice, citing a no-dogs policy and complaints from neighbours. Veterans issues in general have heated up the federal election campaign trail, but a quiet housing crisis in their ranks remains a rarely-addressed topic in Canada, although a long-simmering one south of the border. But for advocates of those who have served their country, homelessness is top-of-mind. “It continues to plague the veterans' community,” said Mike Blais, founder and president of Canadian Veterans Advocacy, based in Niagara Falls, Ont. Blais served in Canada's infantry for 17 years, including time in Cyprus and Cold War Germany, leaving in 1993. Many veterans return from battle scarred emotionally and physically, he explained. At home, they grapple with the persistent effects of trauma that make earning an income or making ends meet on military “lump sum” payments difficult. Under previous governments, Canada provided lifetime financial support to many injured vets. The Liberal government under Paul Martin replaced those with a one-time cash payment and the change came into force under the Harper Conservatives. "That lump sum goes fast,” Peavey said with a wry chuckle. As a result, many wounded or PTSD vets sink into debt despite their payout. Marriages crumble and families fall apart. He added, “For those who sustained mental wounds, often this is the defining point that sends them over the edge into homelessness or couch-hopping, staying with a friend for a couple weeks and either wearing out their welcome or moving on voluntarily to another friend's house." VETS Canada matches affordable, safe housing like this apartment for veterans in need. Others, like Peavey, find the only shelter they can afford in substandard apartments that only worsen their sense of alienation or fear. After he left the Forces, Peavey lived in a gritty Dartmouth apartment project rife with noise, stabbings, murders and other crime. He installed three or four extra locks on his door. Faced with the challenge of returning to civilian life, veterans have historically banded together, as Royal Canadian Legion branches in many towns and cities attest. But with eight Veterans Affairs support offices closing in communities' from coast to coast since 2009 and the loss of 900 staff, those who served Canada once are now responding to another call of duty, to help comrades who feel abandoned by their country. That was the case for 17-year army veteran Jim Lowther, whose service to his country included peacekeeping in Bosnia, logistics, and action as a sniper in the Persian Gulf after Sept. 11. Five years ago, Lowther was dishing out Sunday dinner as a volunteer at a Halifax soup kitchen, when he saw a face he recognized as a former comrade in arms. Lowther assumed he was also there to volunteer. In true military spirit, Lowther responded, inviting other veterans and retired RCMP members he knew to form a “boots-on-the-ground patrol” to scour area homeless shelters. Sure enough, they found lots of veterans who were homeless or under-housed. Then the calls for help started coming in, from as far away as Alberta and B.C. Since launching Veterans Emergency Transitions Services, or "VETS-Canada," in 2010, Lowther and his wife Debbie have assisted Canadians leaving the armed forces or RCMP transition to civilian life — and in particular, to find a safe affordable home. A few organizations like Vancouver's Honour House offer lodging to vets in medical care, but only on a temporary basis. Lowther dreams of starting a cross-Canada network of veteran-specific affordable housing. Last year, the group was awarded a $900,000 contract from the federal government for its front-line housing work, to be spent over three years. Not all veterans need emergency help, Lowther explained, but the high incidence of trauma, suicidal thoughts and disabilities — compounded often by domestic tensions and sometimes by addiction — mean that peer support is key to a successful post-military transition. Because when things go wrong, they can go really wrong. Last year, the organization discovered a veteran, his wife and three children living inside a storage container. That ex-soldier had made what seemed at first like a successful transition into a steady job, Lowther recalled. But his PTSD worsened, and after suffering a breakdown he was out of work and financially strapped. He and his family of five moved into a bachelor apartment — until the landlord discovered the overcrowding and evicted them. “So rather than separate, they decided they would move into a storage unit," Lowther said. "They were there for a couple weeks before they were brought to our attention." VETS Canada found them a motel room and shortly after, a more appropriate suite. But the next steps were also crucial: the organization then secured the father counselling for his trauma, and helped the family navigate Veterans Affairs' services. 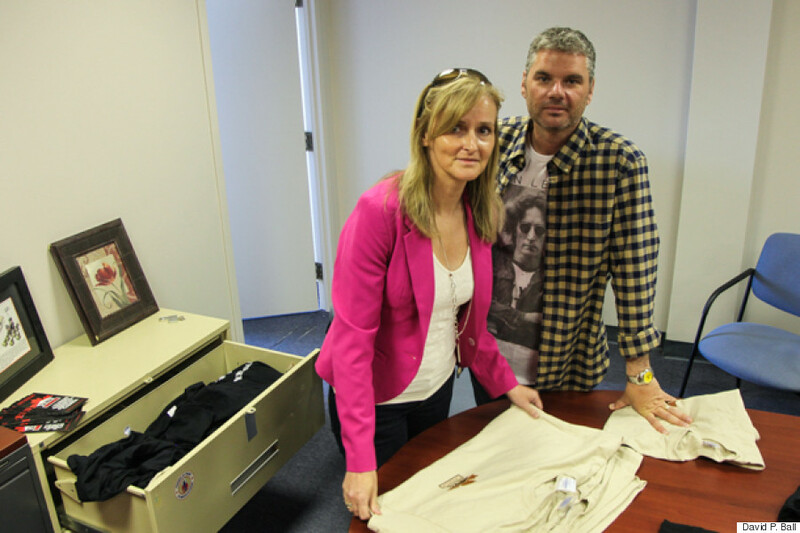 Jim and Debbie Lowther's organization has helped veterans across Canada. According to the Veterans Affairs Canada website, “One homeless veteran is one too many.” However the department provides no information about how many ex-servicemen and women lack housing, citing “limited data.” Veterans' organizations agree the number is hard to track but significant. The Ministry does provide direct assistance for vets at risk of losing their homes to access emergency funds, peer support, job training and other help. In an emailed statement, spokeswoman Kate Murphy said that the Ministry supports an approach adopted across federal agencies known as "Housing First" — which emphasizes adequate shelter as a basis for other health and welfare interventions — and works with shelters and agencies such as VETS Canada and Wounded Warriors to identify homeless vets. "Veterans Affairs Canada is working to reduce homelessness among veterans, cut red tape and reduce the complexity of applying for support from the Department and is also ensuring that all benefits and services are focused on helping veterans," Murphy said. That's all well and good, acknowledged Blais, and outreach is vital. But he added the federal government needs to step up its leadership, and not simply outsource its responsibilities to private organizations. Blais praised VETS Canada for the "courage" to go out and find vets in need, sometimes in rough neighbourhoods or situations. But he argues that veterans’ housing and mental health assistance needs better co-ordination across the board, and that must come from their common former employer: the national government. "Why should veterans themselves have to respond to the crisis with absolutely no leadership from Veterans Affairs Canada?" he demanded. "They have to acknowledge their obligation." Dave Peavey, at least, may be winning his skirmishes. His landlord backed down on the eviction notice, although with some restrictions on Norm's movements. His neighbours have become more understanding of his need for a service dog. Nonetheless, he launched a human rights complaint against his eviction last spring that is still underway. He and others also successfully fought for legislation to be introduced in Nova Scotia that would prevent future discrimination against PTSD-dogs by landlords — he expects to see it tabled this fall. He says he’s had "terrific" support. But when it comes to veterans left homeless or insecurely sheltered, he and other advocates call on the federal government to do more to address a threat that's slipped too long under the radar. "They're the ones who sent us over there. They're the ones who should be taking care of us." CORRECTION: A previous version of this story stated the Harper Conservative government replaced lifetime financial support to many injured vets with a one-time cash payment. In fact, it was the Liberal government under Paul Martin that introduced the change, which came into force under the Harper Tories. David P. Ball reports on affordable housing for Tyee Solutions Society.